Perennial. Zone 3. Asteraceae. Eastern North America. My first glimpse of Ironweed at the UBC Botanical Garden in Vancouver left me completely smitten. I’d certainly heard about it before, often recommended as a back-of-border fall-bloomer, but the reality of the eye-popping neon purple and the intricacy of the flower clusters was hugely more appealing than any of the rather washy photos I’d seen. Vernonia is a huge genus estimated at over 1000 species worldwide. A number of the tropical species are important food plants, producing edible foliage. I have not yet heard of a similar use for any of the more temperate varieties, though a study of ethnobotany would doubtless find culinary and medicinal uses on this continent as well. 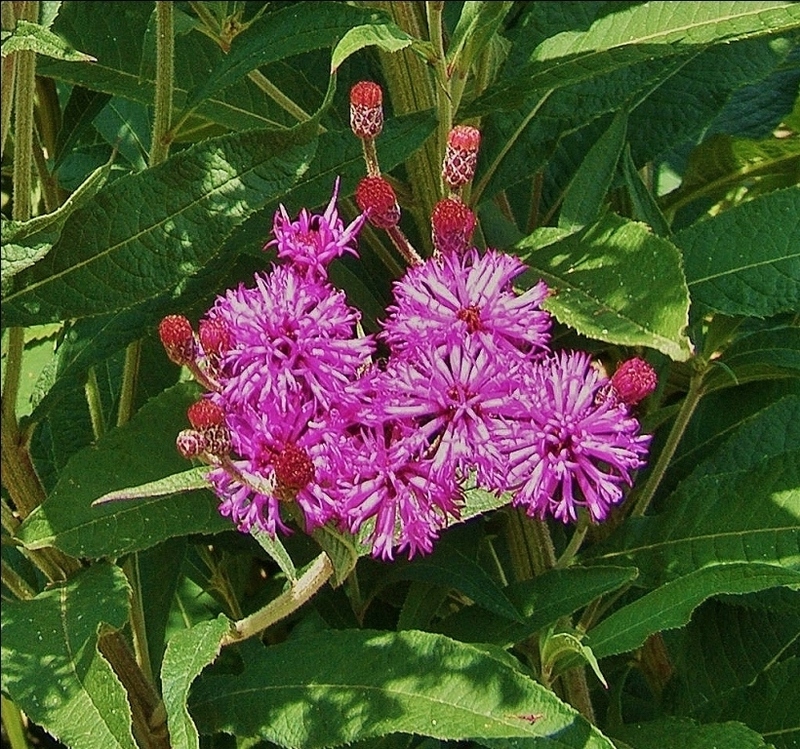 Of the 17 Vernonia species documented in North America, noveboracensis is probably the best-known. It is named after the English botanist William Vernon who first collected specimens of the plant in Maryland in 1698. The specific name, noveboracensis, refers to its wide occurrence in the state of New York, and indeed through a large range on the eastern seaboard from Massachusetts to Mississippi. It does not appear to be native to Canada, though it is now widely available from specialist nurseries in this country. Ironweed’s common name most likely comes from the rusty-red colour of the seedheads. As the vivid purple petals eventually wither and turn brown, clinging to their calyxes, small puffs of rather dandelion-like seed clusters emerge. These are eagerly consumed by chickadees and other small seed eaters, who love to perch on the sturdy ironweed clumps to forage for food and to survey their surroundings from a safe height. The stems of ironweed are also iron-strong, as one of the UBC gardeners joked to me. This is not a flower to be casually snapped off – pruning shears are definitely in order when harvesting blooms for bouquets. And you will definitely want to do that. The vivid purple tassels contrast perfectly with other fall bloomers; the paler mauve Joe-Pye Weed, any of the Rudbeckia, Echinacea and taller Sedums, late-blooming Phlox paniculata, plume poppy, the Michaelmas daisies and the last of the annual sunflowers all combine to make a sweetly fragrant and long-lasting autumn arrangement. Ironweed is definitely a wildflower; unkind souls might even dismiss it as rather weedy. Undeniable – I certainly would not place it in a front-row position. At the border back it provides a nice foliage presence to frame more “domesticated” earlier flowers, and, once these are over, a welcome burst of colour to usher in autumn. Brilliant purple, sweetly fragrant tassel-flowers emerge from clusters of elongated, geometrically-checkered buds mid-August through September. Foliage is undeniably rather coarse. Heavy, pointed and lightly serrated 6 to 8 inch long, lanceolate leaves are dark green with paler undersides. THese are arranged alternately along the sturdy stems. 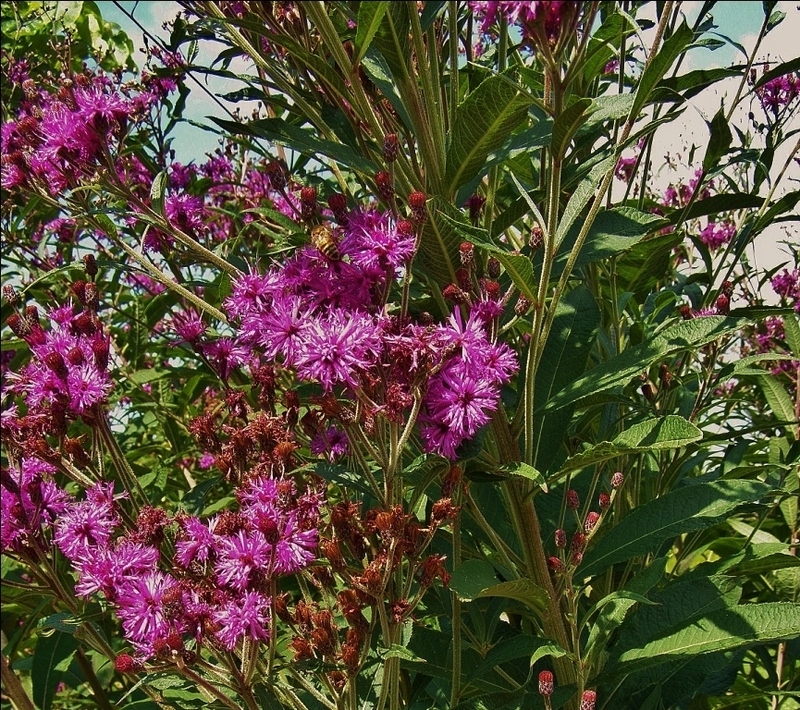 This ironweed is a sturdy clump-former, 4 to 6 feet tall, with a 2 to 4 foot spread. It grows largest on moist soils. It does not run from roots. It may self seed, but is not invasive in my experience. For shorter, bushier plants, cut back when 24″ tall; new growth will quickly re-sprout and produce double the flowers in late summer on more compact plants. Handsome in its own rough way, Ironweed is best sited as a back-of-border or wild garden plant. It comes into its own in late summer and fall when the main perennials bloom seasons is over. Rather similar in effect and garden use to Joe-Pye Weed (Eupatorium) but colour is much more vibrant, being a “neon” shade of bright purple. Blooms fade to red-rusty brown, which is likely the reason for the common name. A grand bee and butterfly flower, and an important nectar source in late summer. It is visited by migrating hummingbirds as they travel southward. The seed heads may be left on plant to provide seed for wild birds (though this may result in self-sown seedlings next year), or clipped off. Sturdy stems stand up to heavy snowfall; a favourite perch for small seed-eating birds if the seed heads remain. Oh, and it’s deer resistant. Widely adaptable to most situations. Likes moisture but tolerant of dryness. Prefers soil on the acidic side, but happily tolerates alkalinity.